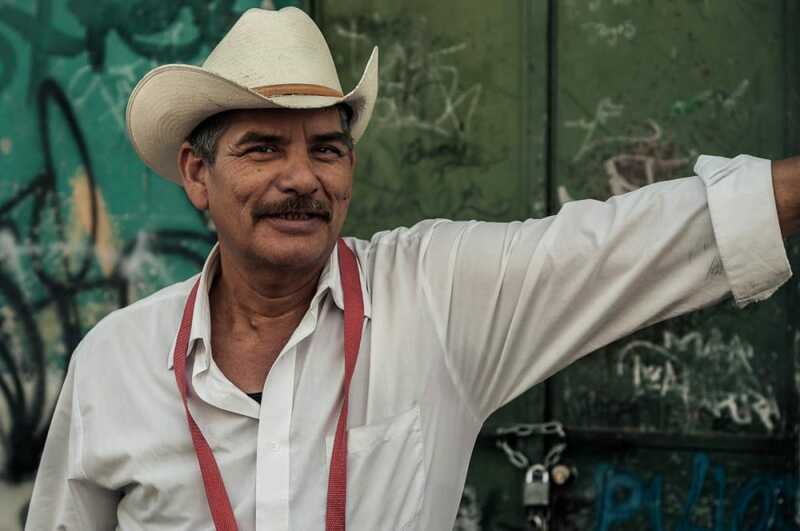 As diverse as Mexico is, the same can be said for its music. The country’s musical history started thousands of years ago with, of course, its indigenous people, and it continues evolving today in the bars, living rooms, and streets of its small towns and big cities. Banda, mariachi, norteño, and ranchera are among today’s most popular genres which play on the radio and on one’s cell phone, but other genres which have developed include huasteco, jarocho, grupera, tamborazo zacatecano, and marimba-based ensembles. Banda music: this horn-heavy genre of Mexican music usually features, at least, a dozen guys in matching neon-colored suits who play polka-influenced, military marching band-based tunes. Clarinets, trumpets, trombones, tubas, French horns, more trumpets, powerful virtuosic singers, bass and snare drums all make up the instruments in a banda. There are no stringed instruments here like the violin or gut-stringed guitar found in mariachi. 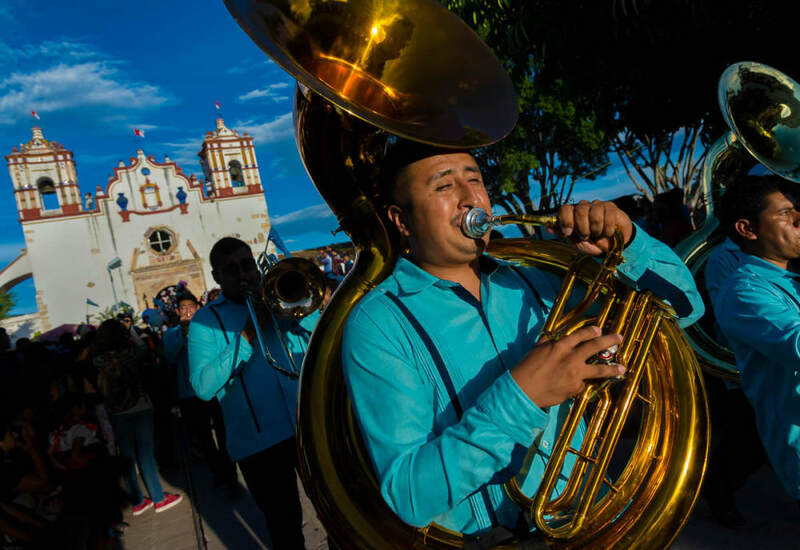 A typical banda has at least 12-15 musicians, but the largest groups can have 20 members who play a combination of cumbias, corridos (narrative story-songs), rancheras, and ballads. It’s a catalog of songs that’s not always unique to the genre itself but which sometimes stretches back a century and a half to pre-Revolution Mexico. People in Mexico either love banda or they hate it. It’s kind of like how country music in the United States is perceived by city folk. But banda is much, much more popular in Mexico than country music is in the U.S., its long-term appeal having long outlived the flash-in-the-pan Nashville sound of the late 50s. The popular banda songs heard constantly on the radio today are modern compositions, written and marketed like pop tunes. They usually tell melodramatic tales of spurned love and found love and, well, anything to do with love. This makes it an easy target for critics of pop music in any genre. But the highly syncopated music with complex changes and rhythms is made for dancing (and dancing close), drawing big crowds to weddings, holidays, parties, rodeos, parades, baptisms, quinceañeras, even indoor church services. 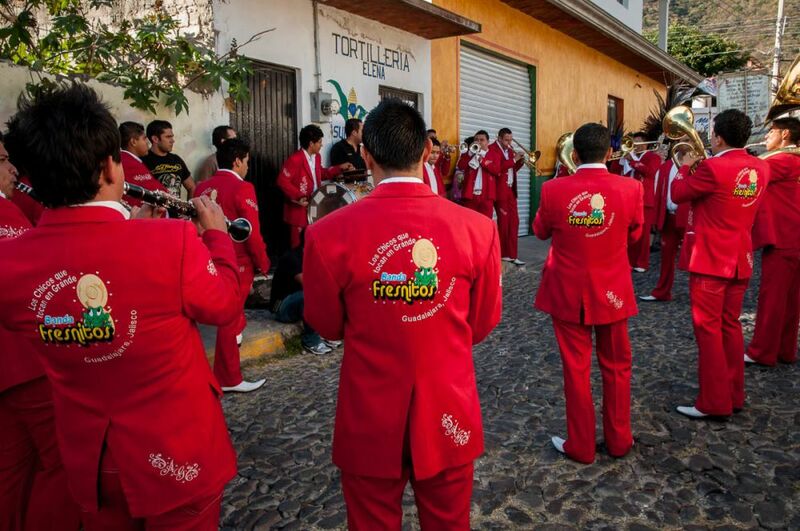 Banda Fresnitos play in matching red suits during the procession for Our Lady of the Rosary in Ajijic, Mexico. A banda performs during the Fiesta de la Sangre Preciosa del Cristo (the Precious Blood of Christ) in Teotitlán del Valle in Oaxaca, Mexico. A banda group plays during a religious procession for Our Lady of Mercy in San Cristóbal de las Casas, Chiapas. During the fiestas patronales in Ajijic, Jalisco, a banda performs under the kiosko, the central raised and covered platform in the middle of a plaza. 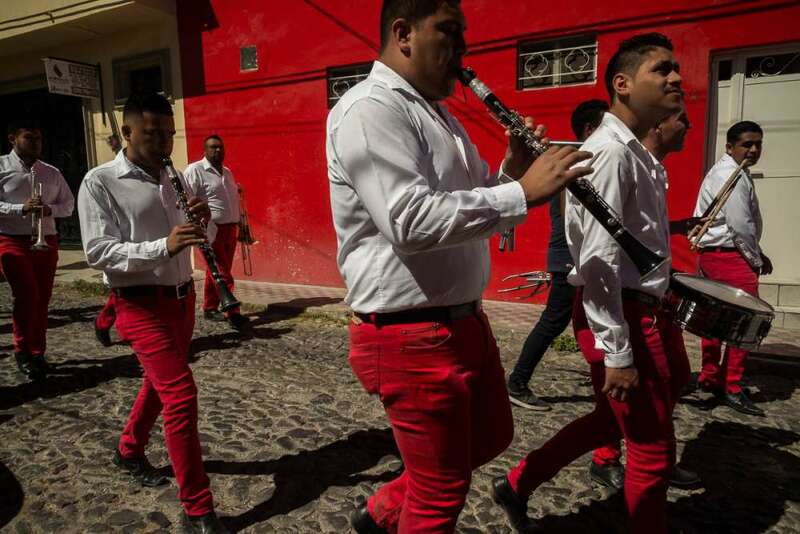 A banda in matching red pants plays during a parade in Jalisco, Mexico. 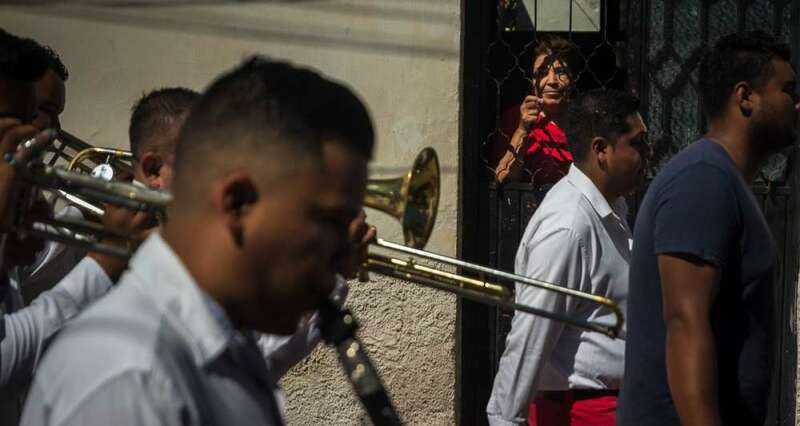 A woman peers out from the window of her front door to watch a banda pass during a procession in Ajijic, Mexico. A banda and a group of Aztec dancers accompany a procession for San Sebastián as it arrives at Ajijic’s oldest church. 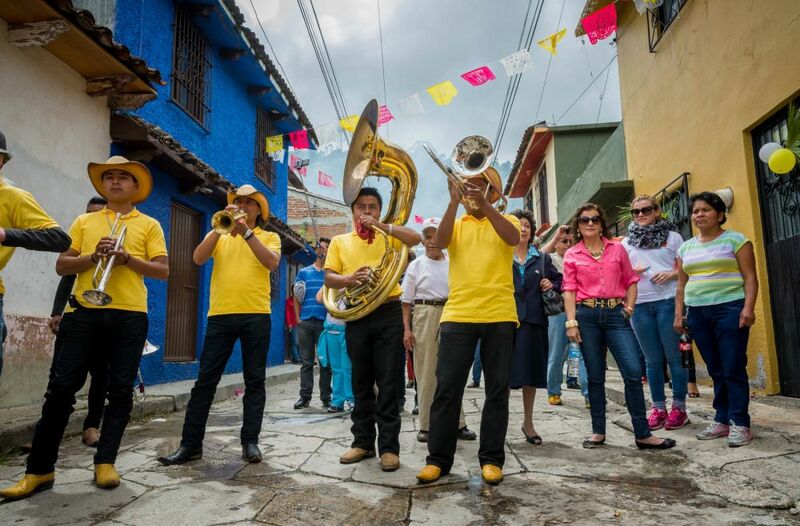 A banda during Carnaval pounds out the music while the parade makes its way through the streets of Ajijic, Mexico. VIDEO: Watch this video of “Tengo Que Colgar” (“I Have To Hang Up”) by Banda MS, currently one of Mexico’s most famous bandas. Norteño music draws some of its material and its sound from the same pool as banda, but features different instrumentation, namely the addition of the accordion and a couple bajo sextos, which are Mexican 12-string guitars. A standup or electric bass guitar replaces the tuba to fill out the bottom end.The drummer uses a standard drum trap, but a single snare drum and cymbal is enough, and even that’s not always required. The drummer uses a standard drum trap, but a single snare drum and cymbal is enough, and even that’s not always required. The snare drum is a prominent player in norteño music, often firing off elaborate drum rolls between the singer’s lines. 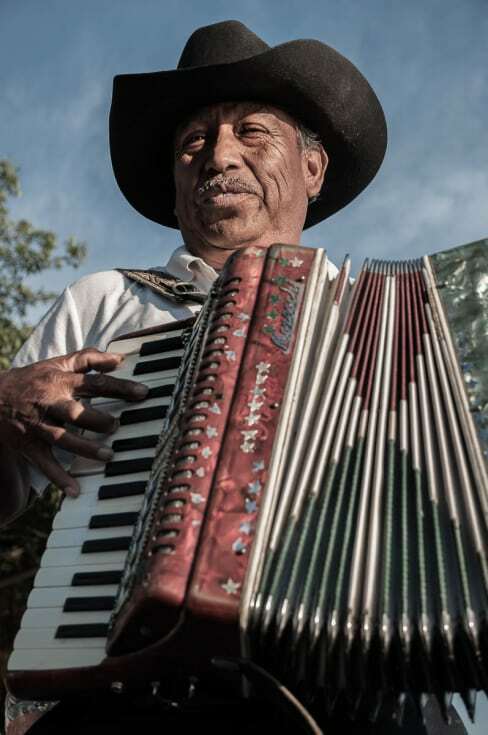 Though not all norteño bands have an accordion, most do. And a banda will almost never have an accordion player. This key rule, if remembered and divulged under the right circumstances, will surely impress all your friends. The smaller size of a norteño group, which is normally just five men (and yes, they are usually always men), makes it an ideal setup for musicians who play in restaurants at guest’s tables and public areas. 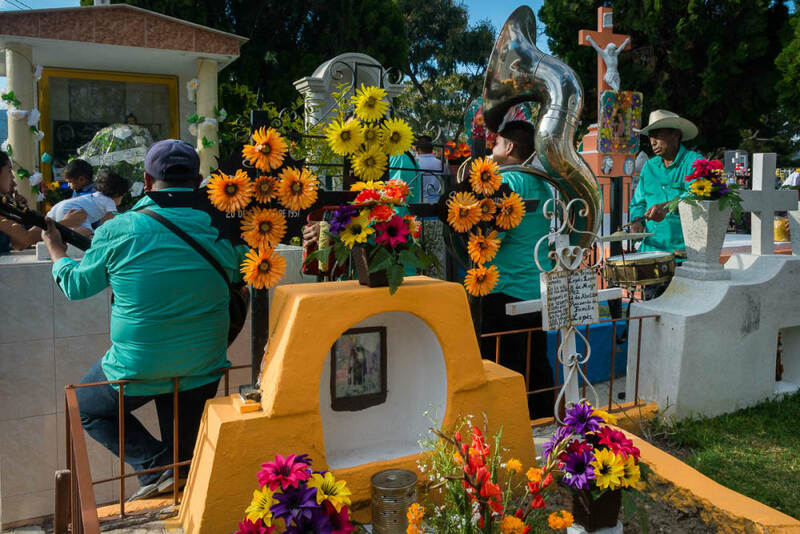 Musicians play in the graveyard in Chapala, Jalisco, for a family in mourning on the Day of the Dead. 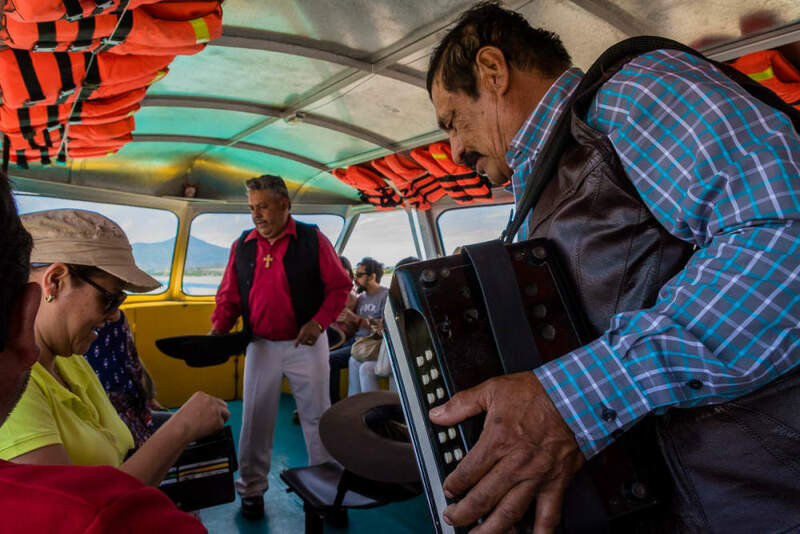 Musicians collect money after performing to a captive audience on a boat ride to Janitzio in Michoacán, Mexico. 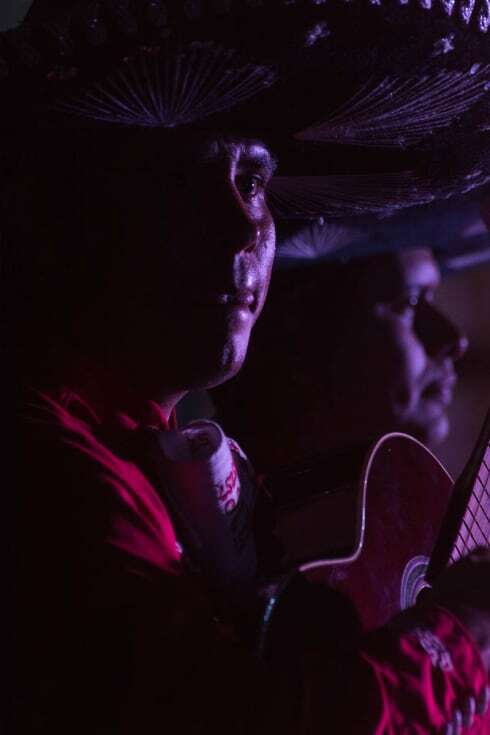 An accordion player performs “Las Mañanitas” in Chapala, Jalisco. 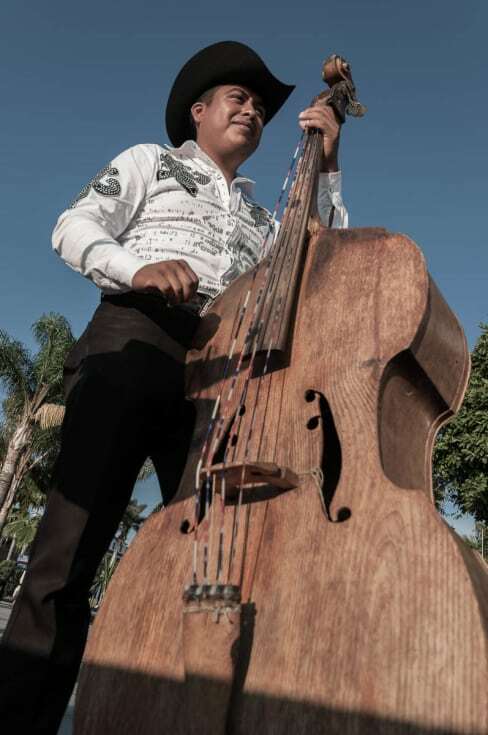 A bass player performs “Las Mañanitas” in Chapala, Mexico. 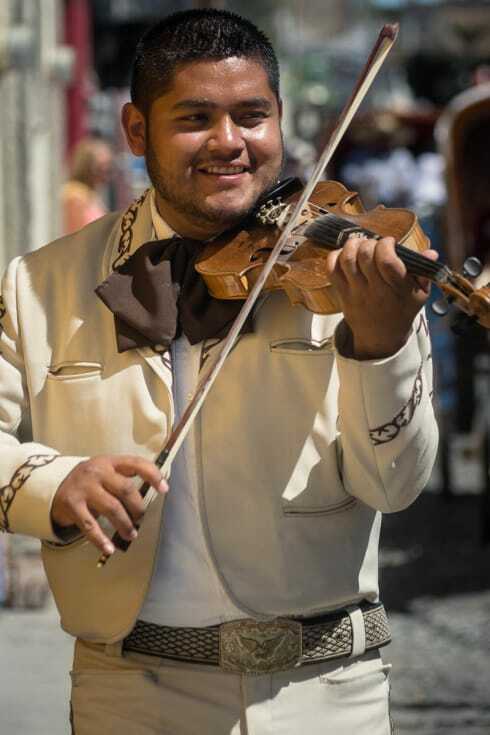 A musician on the street in Guadalajara, Mexico, before starting work on a Saturday night. Portrait of a musician taken before he goes to work on a Saturday night in Guadalajara, Mexico. Mariachi is the style of traditional Mexican music that most outsiders associate with Mexico. Some of its most popular songs, such as “Cielito Lindo” are known the world over. The instrumentation is based on a chorus of violins, guitar, harp, and vihuela, which is a high-pitched, round-backed guitar. The trumpet plays second-fiddle to the, well, fiddle in a mariachi group, usually consisting of just two, but sometimes three, trumpeters in groups that commonly reach 10-15 players. 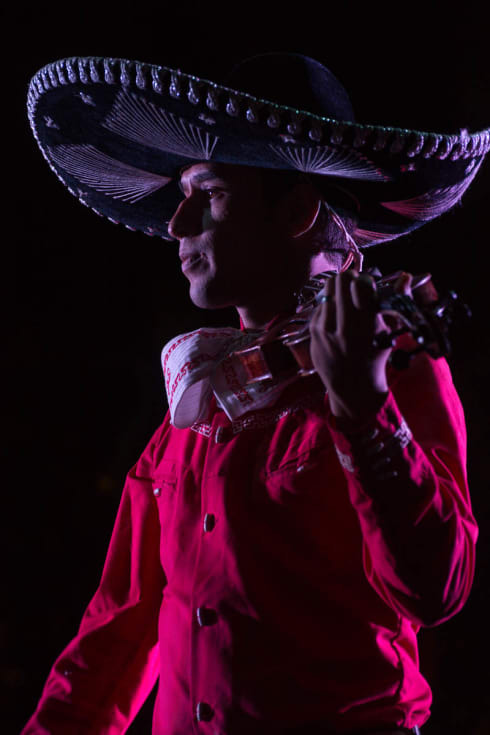 Tito Hinojosa, violinist and a singer for Mariachi Real Axixic, performs a song about Ajijic, his hometown in Jalisco, Mexico. Mariachis Carlos Álvarez (foreground) and Hector Flores during a performance on Independence Day in Ajijic, Jalisco, Mexico. 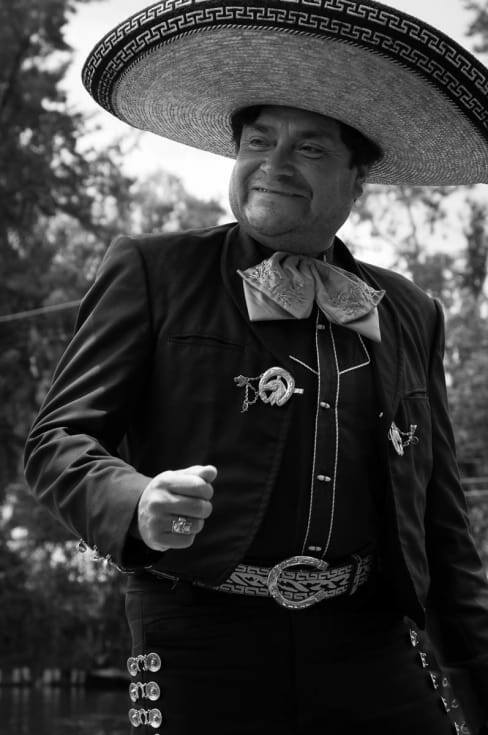 Daniel Medeles, director of Mariachi Real Axixic. Carlos Torres plays trumpet in the group Mariachi Real Axixic. Leonel Herrera, who plays harp in Mariachi Real Axixic. 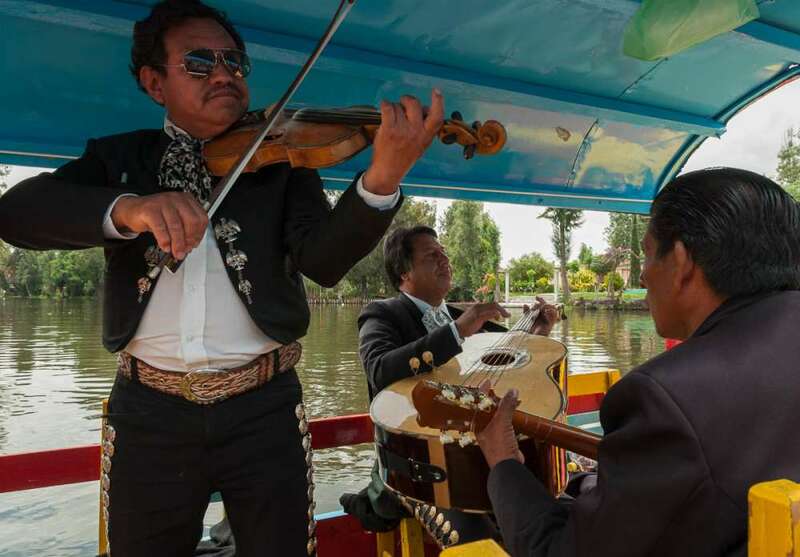 Musicians at Xochimilco in southern Mexico City meander the floating garden’s canals in small boats, boarding these large trajinera boats after being hired to play some songs — usually more than a few, for the passengers as they eat and drink during the afternoon. 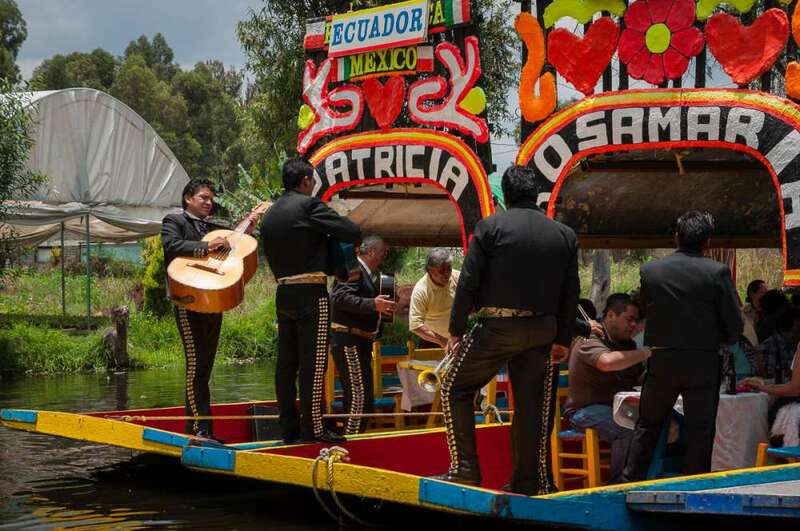 In Xochimilco, a group of floating mariachis play “Las Mañanitas” from a boat along one of the UNESCO heritage site’s floating canals. A mariachi singer performs at Mexico City’s “floating gardens” of Xochimilco. A mariachi singer performs for visitors at Xochimilco. A violinist in a mariachi group plays during a parade for a quinceañera in Ajijic, Jalisco, Mexico. 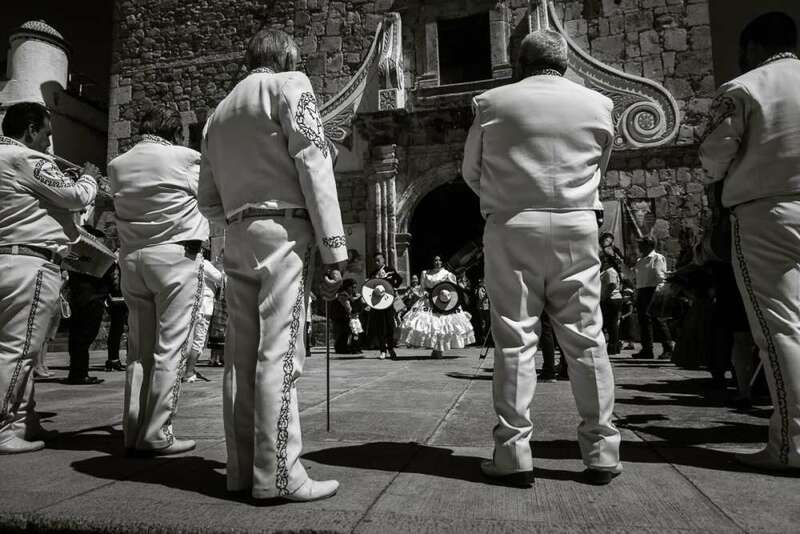 A mariachi group performs after a mass for a quinceañera in Jalisco, Mexico. The group Mariachi Tradicional de Acatic play mariachi music, but with the original instruments that came before the vihuela, guitarrón or the harp, such as armadillo and tortoise shells, wood blocks and clay pots. The group Mariachi Tradicional de Acatic play mariachi music with the traditional instruments, song involving conch shells during a performance in Ajijic, Mexico, during the Festival Sangre Viva (Living Blood Festival). VIDEO: Living legend Vicente Fernández performs “Hermosa Cariño.” Vicente, or simply Chente if you’re hip, is universally revered in Mexico and it’s impossible to escape his immediately recognizable voice coming from car stereos, neighbors’ living rooms, or the nearby bar. With a career spanning over 50 years now, he is the Sinatra, Elvis, Roy Orbison and Michael Jackson of Mexican music, but he’s outlived them all. Kids form a drum corps on Revolution Day in Mexico. A bugle player during a religious desfile parade for Our Lady of the Rosary in Ajijic, Jalisco, Mexico. 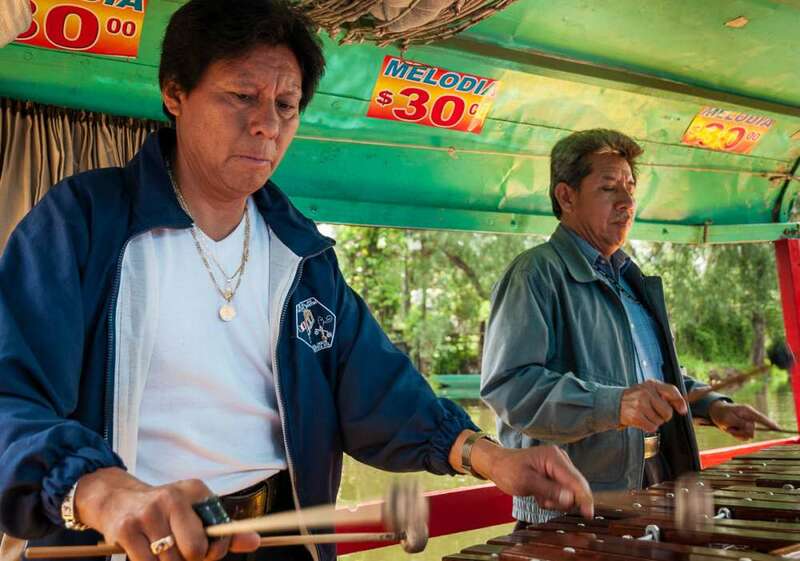 Marimba players double-up while on board a boat at Xochimilco in Mexico City. One of Mexico City’s 500 organ grinders, who today carry on a long tradition of grinding out songs for tips on the city streets. The organ grinders are unique to the city, though sometimes you can find them passing through towns in other states.